ISBN-13: 978-0670020959A personal and medical odyssey beyond anything most women would believe possible. At age forty-four, Alice Eve Cohen was happy for the first time in years. After a difficult divorce, she was engaged to an inspiring man, joyfully raising her adopted daughter, and her career was blossoming. Alice tells her fiancé that she’s never been happier. And then the stomach pains begin. In her unflinchingly honest and ruefully witty voice, Alice nimbly carries us through her metamorphosis from a woman who has come to terms with infertility to one who struggles to love a heartbeat found in her womb – six months into a high-risk pregnancy. What I Thought I Knew is a page-turner filled with vivid characters, humor, and many surprises and twists of fate. 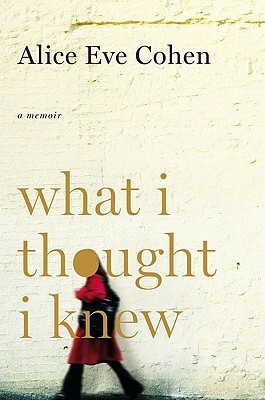 With the suspense of a thriller and the intimacy of a diary, Cohen describes her unexpected journey through doubt, a broken medical system, and the hotly contested terrain of motherhood and family in today’s society. Timely and compelling, What I Thought I Knew will capture readers of memoirs such as Eat, Pray, Love; The Glass Castle; and A Three Dog Life. I started reading this book not sure if I’d like it or not. I didn’t know if the author wrote it in a way I would enjoy, because of the sensitive subject. And for the first few pages I still wasn’t sure. But before long, I was hooked. I didn’t want to put it down and read it in two sittings. I would have read it in one if I hadn’t had to stop and do things that had to be done. The writing is terrific, as is the story. And it’s a true story. One that I can’t imagine going through. It is at times happy, and others very deeply sad. It’s full of confusion, worries and very hard decisions. And a lot of happiness and love. The author is very funny at times too. Alice Eve Cohen holds nothing back in this book. She shares her thoughts and feelings through this time with an openness that surprised and touched me. I felt like I was listening to a friend talk. I’ve seen a few negative reviews, saying that the author was self centered and only thinking about herself. I didn’t get that from the book at all. She was devastated that she didn’t know she was pregnant for the first 6 months and so she had been drinking etc. Because of that, her baby was subjected to things that weren’t at all good for him/her, and didn’t get the care needed, like vitamins. She also was told the baby would more than likely have a few devastating health disabilities, due to her age and her own medical conditions. That was the reason she had the thoughts she did. But, she still did whatever the doctors told her to do for the safety of her unborn child. This book was so good. Really really good. The best memoir I’ve ever read. If you haven’t read this book, go get a copy. It’s a quick read that is packed with a very emotional story. This sounds like quite an absorbing memoir. Terrific review, Vicki! Thanks Susan, it was really a great book! I was the same way about this one. At first I wasn’t sure but it grew on me very quickly. I read this years ago and felt the exact same way. It was like talking about an experience with a friend, rather than reading a book. This sounds like an amazing read. I can’t even imagine being 44 and learning I am 6 months pregnant. Do you know what happened with the baby? I have to know. I do know, but don’t want to spoil it for anyone who might want to read the book. Wow – sounds like a compelling story! This does sound like a compelling story and something that I would love to read. Thanks for the great review! This does sound like a wonderful and emotional read though a read I should probably have some spoilers for before going in! I’m so glad it ended up working out for you and I’ll definitely have to look for this one.